Lemon, rosemary and garlic is a delicious combination and used this way, mixed with olive oil and smeared over, it really infuses the meat. 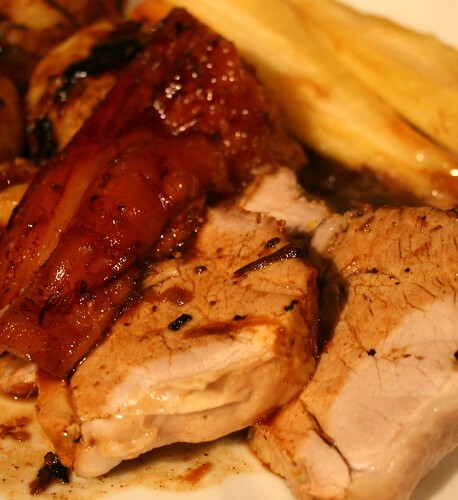 Make sure you have leftovers as this pork is fantastic cold in sandwiches the next day! For crispy cracking ask your butcher to score the skin of the joint of pork you want to use. Make sure the skin is dry and rub it with salt. Mix the zest of a lemon, a pinch of salt, 2 crushed garlic cloves, the leaves from a sprig of rosemary and a squeeze of lemon juice with some olive oil. Smear this over your pork joint, massaging it in and pushing the rosemary and garlic through into the meat where you can (make some slits in it if you need to). Peel and quarter a large onion and sit the pork on top of it in a roasting tray. 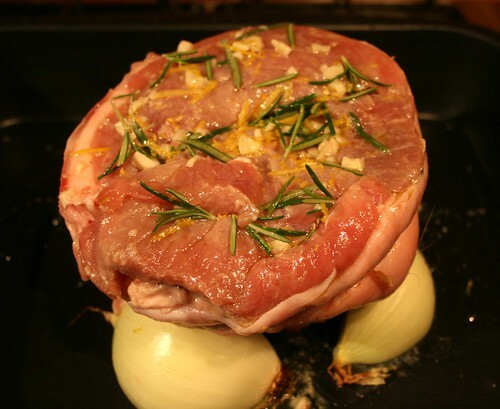 This will further flavour the pork and give you the base for a great gravy. Put this into the oven at a high setting, around 240, for 20 minutes then turn the oven down to 190c and cook for about 35 minutes per 450g. There should be no pink juices once the pork is cooked.